This topic goes into making polygons based on point locations; Using QGIS Geometry Generator to get rectangle from point? Is there a way to apply a rotation to the geometry generated? I have a field that contains a 0-360 degree rotation value and would like to rotate my built geometries based on that value. Also, this is a C++ solution you can check out as well. 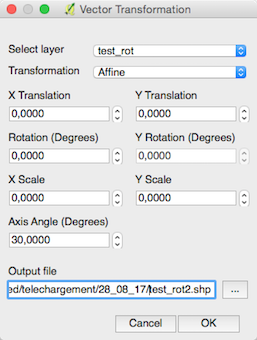 if you know Python, before using Shapely, you can use the rotate function of a QgsGeometry in PyQGIS (Rotación de archivos vectoriales con método ‘rotate’ de QgsGeometry en PyQGIS, in Spanish but the scripts are universal) or the Affine Python module. Not the answer you're looking for? Browse other questions tagged qgis pyqgis geometry geometry-generator rotate or ask your own question. Is there a way to interactively rotate labels in QGIS using any of the edit tools?